I’ve been making my own vanilla extract for years. I love it! It’s cost-effective, sort of pretty (although it kind of looks like spiders too), and in my opinion, tastes way better than imitation vanilla extract. Vanilla extract is also (easily) the most used extract in my kitchen, so having a big batch on hand is no problem for me. I tested out four different flavors: almond, lemon, orange, and mint. Since I was testing, I didn’t want to make large batches (in case they didn’t work out). For each extract I started with 1/2 cup vodka. For the orange extract, I added the rinds from 1 1/2 oranges. For the lemon extract, I added the rinds of two lemons. For the almond extract, I added 1/4 cup raw almond slivers (no skins). And for the mint extract, I added a small handful of mint leaves. I placed the ingredients in a clean jar, sealed it up, and waited for two weeks. I loved the citrus extracts! They smelled amazing and tasted good. Extracts are not meant to be tasted straight; they are meant to be baked or mixed into larger recipes. When you bake extracts, the alcohol evaporates (or mostly evaporates), leaving behind only the desired flavor. The almond extract was too mild. I would suggest allowing it to soak for at least a month before use. I found that it seemed a bit more bitter than store-bought almond extract. I had read that using raw almonds and avoiding the skins would help to keep the extract from becoming too bitter. But I think I’ll probably stick to the store-bought kind in the future. The mint extract simply didn’t work. It looked pretty seaweed-y and it tasted like black licorice. I think you just can’t allow fresh herbs to soak that long. Fresh, leafy herbs (like mint or basil) work well in infused vodka, which has a much shorter soak time. I wonder if using dried herbs would work better. Maybe using some dried lavender could work well. Have any of you tried that? Be sure to strain your homemade extracts through a fine mesh sieve before storing. The only one I don’t do this with is vanilla extract. I figure if a few vanilla beans (not the actual pod) make it in that’s totally fine. But you’ll want to strain the other ones. I tested out four different flavors: almond, lemon, orange, and mint. Since I was testing, I didn't want to make large batches (in case they didn't work out). For each extract I started with 1/2 cup vodka. For the orange extract, I added the rinds from 1 1/2 oranges. For the lemon extract, I added the rinds of two lemons. For the almond extract, I added 1/4 cup raw almond slivers (no skins). And for the mint extract, I added a small handful of mint leaves. I placed the ingredients in a clean jar, sealed it up, and waited for two weeks. Check the post because most of these worked well but one did not! Also I shared some additional tips and tricks. Credits // Author and Photography: Emma Chapman. Photos edited using Color Pop from the Signature Collection. Ohmy, I didn’t see spider until you said it and now I can’t look at the pictures. Beautiful images and this looks really amazing 🙂 I have been looking for something like this. Perfect! Neat idea. Never thought of making my own before, seems so easy! I love homemade extracts, especially vanilla! I have made coconut extract, and that turned out amazingly, but, as you say, you can’t really smell or taste it as is, you have to bake with it to experience the flavor. Great post! What kind of vodka do you recommend using? Thanks! I can’t wait to try! I do have a question though… does the quality of the vodka you use matter much? Eeeeek it does look like a spider. Sounds great nevertheless…..!!! Try using stonefruit pits (peaches, apricots, or nectarines) for the almond extract. They give a better almond flavor than the actual nuts with none of the bitterness! love homemade vanilla extract. It’s wayyyy better than store-bought and I use it all the time as well. How long do the extracts keep? This is so cool. I’ve been thinking about doing my own Vanilla for awhile now – You’ve totally motivated me! I think it would be awesome to do a follow up post on some recipes that use these different extracts so that I can not only make them but put them to use too. Love it! I’ve never thought of this before! Fun. So you use the whole pod and do not remove the beans? I watched a cooking show where they removed the beans to extract the flavor. I wonder what the flavor difference is. Vanilla sugar is also lovely. Really?! I would not have guessed that. I will be trying that soon. Thanks for the tip! A long time. That’s not a scientific answer, I realize, but it’s because of the alcohol (it’s mostly alcohol in fact). For extract it’s good to leave the pod in the solution as well. This looks amazing! I am running a CHANEL spring make up giveaway over $158! You should come by and participate:D! Hi! I wanted to ask you if you have only used extracts for baking…I mean, have you used it to flavor coffees or teas? Mmmm, lavender extract sounds sooo good! This is amazing! Totally doing this for gifts! Try adding some strips of citrus peel to a spray bottle filled with white vinegar (or vinegar and water mixture). So easy and smells great. I am most definitely going to try this! where did you get those lovely jars? This looks amazing! I love Vanilla, I’ll try make me own now! Ok so if you are going this far, look into making your own limoncello. You will not be disappointed and it is a great entertaining beverage. My husband loves to make his own and it is a unique gift as well. What about making a vanilla extract with spiced or dark rum instead of vodka? I put rum in everything… I mean everything! Might be worth a try!? I’ve been contemplating making vanilla extract for a while now. And all of yours look so great! Especially the lemon! I think I want to try the lemon and orange extract. I find the lemon store ones can be so fake-y tasting. I have no advice to give, sorry; but I’m so thankful you shared your experience! I can’t wait to try. Where did you get your cute little storage jars? I’ve always wanted to make my own vanilla extract! Where can you buy the beans? I’ve never seen them at my local grocery store. They look lovely – I’d even do it for the apperance alone! Great Job Emma, Your so handy in the kitchen! Just don’t crush the kernels. Some stone fruit contain cyanogenic glycoside, which when crushed, can transform into hydrogen cyanide. This is great! I’ve been looking for ideas for unique wedding favors and I think this just might do the trick! Made from scratch and in larger batches I think the citrus ones would be very reasonable cost-wise. My fiance and I both love to cook/bake too so it makes sense for us. I’ve made the same problem with my attempt at mint extract. It tasted terrible and later evaporated quickly. One I have made with great success is bubble gum extract. Take eight pieces of bubble gum (think old school gum like Dubble Bubble or Super Bubble) to 4 ounces of vodka. Wait about a month and you have the extract. It’s great for making bubble gum buttercream. This look really cool!You totally motivated me into trying these recipes myself! Sounds amazing! I think I would try with vanilla first. How many pods do you usually put per 1/2 cup if vodka? I’m so excited to try this!!!! I don’t know why I never thought about it before!!!! Quick question with your big batch about how many vanilla beans are you adding? Where do you store this ? Is it ok to store it in full light ? I’ve tried lavender and I loved the way it turned out! I definitely want to try the lemon next! wow! this is so cool 🙂 i need to try it! Oooh, looks like something I’d want to try! But… erm, I wouldn’t know how to use the extracts. Ideas? Recipies? I’ve made both mint and vanilla extracts using dried herbs and each worked wonderfully. I allow mine to soak for about 4 weeks, or longer. Gah! I just commented… I meant to say that I’ve made both mint and LAVENDER (I think I wrote vanilla)using dried herbs. What a fantastic idea! I’ve often made flavored simple syrups with lavender or cinnamon, but not extracts. I’ll have to try this! I’ve made vanilla and almond extract. But is there a reason you strain out the almonds? I left the almonds in (I don’t care for the taste either) and just strain it when I give small bottles of it away. Does it make that much of a difference? It’s true that the pits contain cyanide compounds but they’re generally considered safe in small doses so extracts are fine. However I have the best luck using the pits whole and just boiling them for a bit first to get off as much flesh as possible. How resourceful- I wonder if it would work with bourbon? I never knew it was that simple to create your own extracts! Thanks for all the tips!! LOve this. Would brandy work as well? I find that vodka has to strident a taste. I definitely want to try this! Especially so that I can be positive that they are gluten free! Hello there! I’d just like to know about the vodka: why is it necssary to use alcohol, and does it affect the flavour of the essence? This was really interesting for me to read because I had no idea that alcohol was involved in extract-making haha! Your extracts soun very good.I make my own Vanilla,but I am going to try your citris ones for sure…Where do you find your bottles? 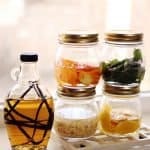 Brilliant article, I have my first vanilla extract on, I add a drop to my porridge every morning instead of using sugar. Now I just need to get some lemons! Have made Banana Extract from dehydrated banana chips. Also poured a little orange extract over a pork lion I was roasting – pretty good!